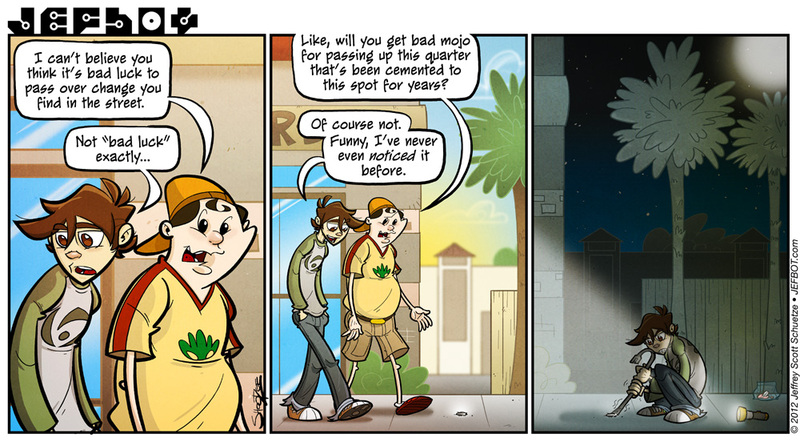 Looking at today’s strip, I think it’s a safe bet that jefbot’s WAY more obsessive compulsive than I am, at least when it comes to dropped change. I remember I used to hunt for coins in the gutter when I was a kid; it’s a wonder I wasn’t sick more often, really. And I can’t even tell you how many coin return slots I stuck my fingers in at the local arcade, searching for quarters. Although bot will probably find some satisfaction and relief to get that coin, I’m pretty sure if it’s been cemented to the street or sidewalk that tightly, it’s probably a good idea to just let it go. Sorry for the single, delayed strip this week! Things have been insanely busy at my day job for the past couple weeks and I’ve been getting ready for a con happening next Saturday and Sunday in L.A. (Stan Lee’s Comikaze Expo, Sept 15-16.) which hasn’t left me much time to work on the strip. Things should be back to normal after the convention, though. Bear with me! Money joke are always funny to me I’m not sure why… Also this miht be my first time beng first. It feels pretty damn good. *jokes *might I hate when I forget my computer doesn’t have auto-correct. glad you like the $$$ jokes, Noramil! Once I found a quarter on the floor of a local shopping mall. I tried to pick it up without success. Then I reached into my pocket and drew my pocket multi-purpose tool I keep with me. I unfolded the screwdriver and pried the quarter off the floor. On the bottom of the quarter, I found a glob of dried super glue. LOL! I love the last panel! That’s awesome! I wonder what would motivate someone to prank people like that, with the super glue trick. What’s the point if you can’t be there to watch their faces? I prefer fishing line and a twenty-dollar bill if I really want to mess with people. Which I almost never do because I’m too damn busy these days. I sometimes with I lived in a igloo, it can get so hot where I live, I would welcome a house made out of snow. you’re telling me, Zolen! it’s been SO hot here in southern california for the past several weeks, an igloo sounds delightful. And as I write, I’m in my flannel pajamas and my feet are freezing. I might need to go downstairs and get fluffy socks. I’d welcome a little SoCal heat right now! and a pet polar bear would be awesome. i might consider moving to alaska if that was real. My old roommate had a Mackenzie River Husky, a huge fluffy dog. I mean, you know I’m not all that tall, but Lonce’s head came to my ribcage. He’s the closest thing to a polar bear I’ve ever lived with. I want one of my own, but living in LA with a fur ball seems like cruel and unusual punishment for the dog. yeah, unfortunately you’re right, T: living in SoCal would indeed be C&U punishment for a polar bear. unless you kept your A/C going full blast at all times, left your freezer and refrigerator doors open, and kept a chilled pool in your living room (with live food). actually, now that i think about it, i’m changing my answer: you could totally keep a polar bear in L.A.! That coin in plastic bag in last panel made me laugh for five minutes. I do that too. But only because pennies accumulate so much faster than the silver. …Cornfather was the one who cemented that quarter down all those years ago, wasn’t he? I call plot twist. could be, JOE! heheh. we might never know. XD I remember hunting for change in the wave pool at Wet n’ Wild…. found twenty bucks once! yes! water parks are great places to find coins, JeweledRose. i used to discover change there all the time. now that i think about it, i don’t think i’ve been to a water park in like, over 10 years! wow. Superstition is a harsh mistress. But occasionally lucrative. In the next few weeks (Ok make it a month and a half) I will be on here whenever I can. Howl-O-Scream starts the 21st and I will be working six days a week, followed by what hubby and I call, Coma Sundays. I will sleep most of Sunday and spend the rest of the day in bed. Superstition….she gets under your skin and makes you do all kinds of crazy stuff! You’re not going to go anywhere with a puny crowbar JB, Use the alien scarves to make a drill!!! I wish Jefbot the best of luck and a little sanity. Also, is that the nickel from last comic in the background of the third panel? ah. jefbot (and i) will take all the sanity we can get, GB! and: yep! apparently, bot went back for that nasty nickel after all. heheh. I always find weird stuff cemented onto sidewalks. The soles of boots, sneakers, human footprints, puppy footprints, some guy’s cellphone number… Never a coin have I seen cemented into a sidewalk! Reminds me of that episode of Ed Edd n Eddy!